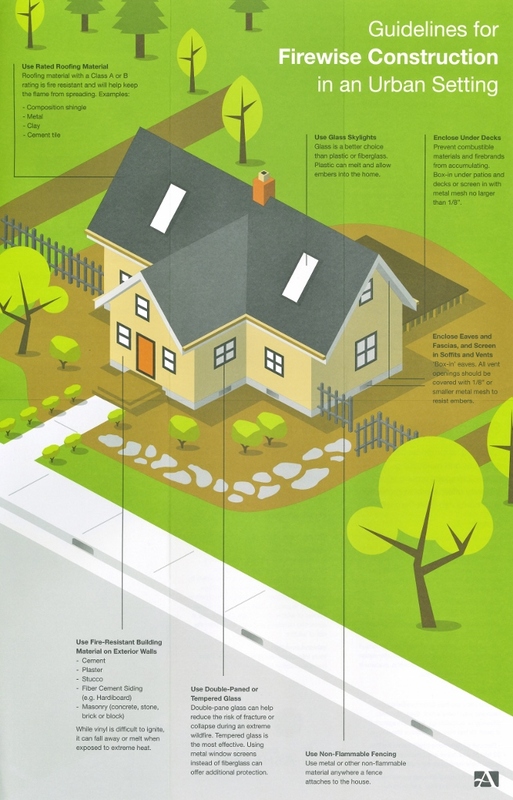 The brochure Guidelines for Firewise Construction was created specifically for the residents of Ashland to provide a framework for choosing appropriate fire-resistant construction materials for their homes. In an urban environment like Ashland, homes can be very close together, sharing defensible space zones with neighboring structures. The proximity of structures makes using Firewise materials even more important for the safety of your neighborhood. Anything attached to the house (decks, porches, fences and outbuildings) should be considered part of the house. These attachments act as fuel bridges, particularly if constructed with combustible materials. Use masonry or metal barriers to separate attachments made with combustible materials from the house. In an urban fire-prone environment like Ashland, a combination of Firewise construction and landscaping is a necessary tool to keep fire from spreading throughout our community. Review this brochure when remodeling or building your house. Note about the brochure: the included pdf file is meant to be printed double sided on 11x17 inch paper, and tri-folded. Printed copies are available at Ashland Fire Station # 1 and by request. Please contact Alison Lerch at 541-552-2231 for more information.